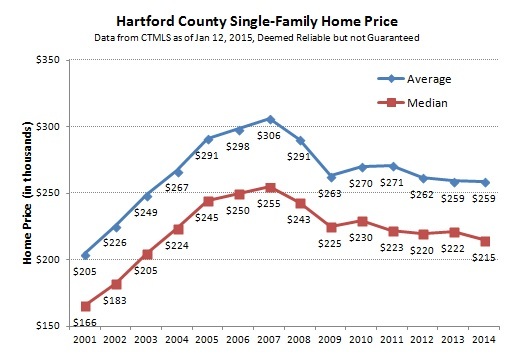 The headline trend in the Hartford County single-family real estate markets in 2014 was that there was no prevailing narrative. After a few years of uncertainty in the late 2000s following the financial crisis, the markets enjoyed a few years of obvious recovery. The results of 2014 cannot be explained in comparable terms. The simple way to explain the year is to say it was a repeat of 2013. 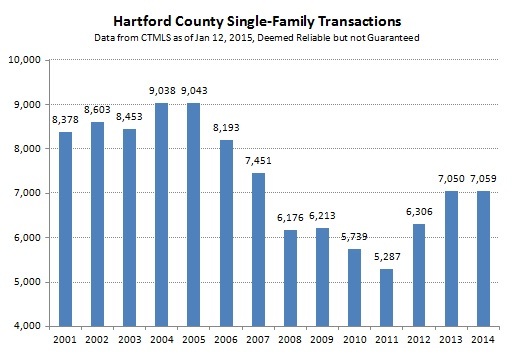 The number of single-family deals recorded in the CTMLS was nine higher in 2014 than in 2013. That’s a surprisingly small difference for a market with over 7,000 total deals. 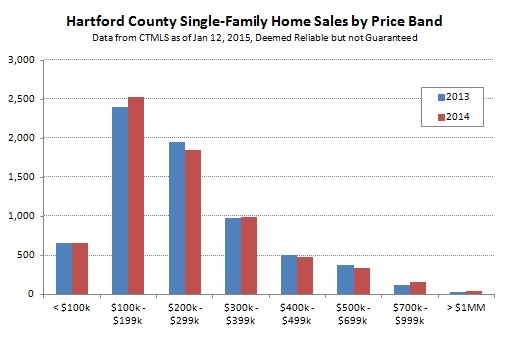 The chart below shows the single-family deal counts since 2001. January is the only time of the year when we review pricing in the real estate market. Other analysts look at median and average prices on a monthly basis. We feel that the lumpiness of the market makes it difficult to trust data sampled over narrow time intervals. Average prices were basically flat in 2014, while median fell by about 3%. The chart below shows average and median prices for single-family homes since 2001. Why didn’t the average and median prices move in the same direction last year? Looking at the number of deals by price band seemed like a good place to start addressing that question. There was a 4.9% increase in the number of deals in the $100,000s and a 4.7% decrease in the number of deals in the $200,000s. We believe that this is evidence of falling home prices during the year. Properties that used to sell in the low $200,000s fell into the high $100,000s. There was an increase in the number of deals that closed at prices above $700,000. In fact, there was a 25% increase in the number of properties that sold for between $700,000 and $1,000,000. This was the second year in a row of strong deal count growth in that price band. It is important to note, however, that the price band only contributed 155 deals to the County’s total, so it is not a fundamental driver of the market. Next Next post: Who’s Watching Me?